A shooting was reported early today in the IT Park in Lahug. 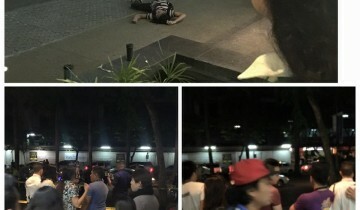 Posts on Facebook by various users reported that the victim was shot in front of the i1 building. No other details were available as of the writing of this article but below are some posts on the incident. Some Facebook posters at the area said the victim was shot dead. Rescuers failed to find Korean divers Baek Seung Kyoon, Heo Seung Yung, and Kim Eun yesterday, a day after they were reported missing while diving in Mactan Island in bad weather. The Lapu-Lapu City Government has suspended the dive shop operations of New Grand Bleu Dive Resort, where the 3 stayed as guests. Genevieve Hope Galag, 25, was arrested yesterday for kidnapping a boy, 3, from Barangay Maguikay in Mandaue City. The boy, who was reported missing Thursday, was found Sunday playing with other children in Barangay Kamagayan, Cebu City. Galag, a resident of Kamagayan, was identified by a witness as the one who took the boy, according to PO2 Girlee Echaluce of the Women and Children’s Protection Desk of Mandaue City Police Station 4. Two other suspects arrested earlier admitted to police they gave the boy to Galag. Top Cebu officials met yesterday to discuss the province’s hosting of key meetings of the Asia Pacific Economic Cooperation (APEC) in August. Davide met with Cebu City Mayor Michael Rama, Mandaue City Mayor Jonas Cortes and Lapu-Lapu City Mayor Paz Radaza yesterday to discuss preparations for the meetings. Davide said they will ask the Department of Public Works and Highways to speed up road work, especially on key areas in Mandaue City, to help ease traffic in the metro.